Venezuela’s opposition has accused the Maduro government of behaving immorally and trying to hide shortcomings and corruption behind bombastic rhetoric. The mainstream opposition coalition boycotted Sunday’s vote, calling it a sham aimed at legitimizing Maduro’s rule despite his low popularity. The latest U.S. sanctions appeared to target in part Citgo[PDVSAC.UL], a U.S.-based oil refiner owned by Venezuela state oil company PDVSA [PDVSA.UL]. More obstacles to PDVSA’s ability to sell oil abroad could restrict already-dwindling foreign exchange earnings, worsening the economic crisis and pressuring Maduro. While it only applies to U.S. citizens and residents, a U.S. official told reporters on Monday that the Trump administration has also tried to convince China and Russia to stop issuing new credit to Venezuela. The two have provided billions of dollars in funding for Venezuela in recent years. But they appeared unlikely to heed the U.S. warnings. Beijing said on Tuesday it believed the United States and Venezuela should resolve their differences via talks, while Moscow said it would not comply with the sanctions. He gave no details of the accusations, but said the U.S. Embassy had been meddling in military, economic and political issues, and vowed to present evidence to the nation shortly. 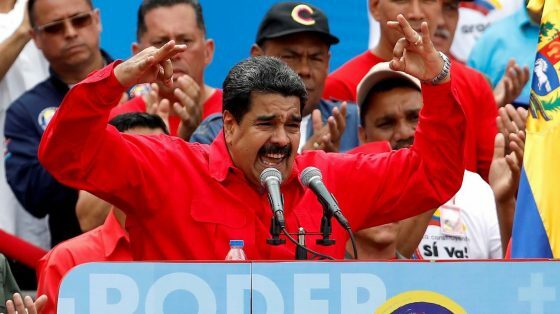 “Neither with conspiracies nor with sanctions will you hold Venezuela back,” Maduro said, at an event in downtown Caracas at the headquarters of the election board, which is run by government loyalists. Full story here.